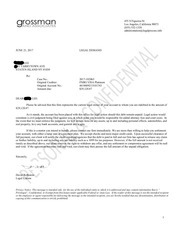 This PDF 1.2 document has been generated by PR Letter Template 7-18-03 -MT v2 - Microsoft Word / Acrobat PDFWriter 5.0 for Windows NT, and has been sent on pdf-archive.com on 23/06/2015 at 03:24, from IP address 161.149.x.x. The current document download page has been viewed 586 times. File size: 21 KB (1 page). sale and possession of counterfeit goods. 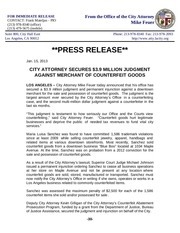 Los Angeles business related to commonly counterfeited items. counterfeit items she sold and/or possessed for sale . of Justice Assistance, secured the judgment and injunction on behalf of the City. This file has been shared by a user of PDF Archive. Document ID: 00283517.